In the wake of the Franzen frenzy about Twitter this week, I thought I’d write this homage. Out of all the social networks, Twitter has a special place in my heart for helping me achieve a life-long dream. Twitter made me an author. Back in 2009, a new boss encouraged us to start incorporating social networking into our daily responsibilities. I’d never heard of Twitter prior to this directive, so I began researching it and set up my own account. My research frightened me – there were privacy issues, viral pictures, all kinds of scary stuff. That research planted the story seeds to what eventually would become my novel, Send, a story about a former bully trying to cope with the suicide he caused with a single key click. YALITCHAT, an online community whose Query KickAround group helped me cull down the thirty (that’s not a typo) versions of my query letter to one. 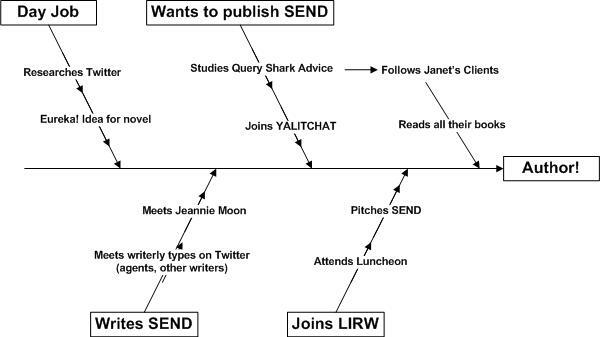 Uber-agent Janet Reid’s Query Shark blog, whose deconstruction of actual submissions taught me what works and what doesn’t. Former agent Nathan Bransford’s website, a virtual encyclopedia of all things publishing. Janet Reid’s Query Shark slush uncovers a few gems here and there. I happened to find her site just when she found Dan Krokos, a writer whose first shot at a query letter had her begging to see his work. Dan’s debut, FALSE MEMORY, comes out this summer with Disney-Hyperion. I added Dan and Janet to my list of writerly folks to follow. From them, I learned about Sean Ferrell, Jeff Somers, Bill Cameron, Robin Becker, Steve Ulfelder. I usually read romances, but I have bought and read books written by ALL of these writers and loved every single word. Sean’s NUMB is literary fiction. Jeff’s CATES series is dystopian sci-fi, Bill and Steve write crime fiction and Robin’s BRAINS is a zombie comedy – all books I would NEVER have bought – indeed, wouldn’t even have borrowed from the library – had I not first ‘met’ these folks on Twitter. Twitter expanded my reading horizons by letting me interact with talented writers I’d never have had the opportunity to discover any other way and I am so grateful. “Interact” is a key concept on Twitter. I think it’s important to note that these folks took the time to talk to me as a person, to engage, and even to exchange opinions on subjects only tangentially related to our writing. I consider more than one of them friends. There are always those who use Twitter as a broadcast medium and log in, make a sales pitch, and log out and worse, ignore tweets from us ‘little people’ – even when directly addressed. Honestly, nothing kinks my colon more than to be ignored. I may or may not read their books and that’s not to be punitive. Rather, it’s simply because I’ve developed loyalties to the friends I’ve met via Twitter and would rather devote my precious free time supporting one of them instead of someone who can’t find the time to say hello in 140 measly characters. *clears throat* Where was I? Right. Twitter. Now would be a good time to point out I’ve never read a Franzen book and after his Twitter-bashing, find myself even less inclined to do so. While I was still struggling with Send, a woman on Twitter convinced me not to delete it when I was convinced the only thing I was qualified to do was sell hotdogs on a New York City street corner. Her name is Kelly Breakey and I need to give her a great big kiss. On Twitter, I also met a woman who has since become a close friend: Jeannie Moon tweeted me one day to invite me to a meeting of the Long Island Romance Writers. I was thrilled to find a local writers’ group, and joined soon after that first meeting. The support, the wisdom, and the camaraderie are priceless. Jeannie, who works as a school librarian, organized a teen read of my manuscript and boy, those kids were AMAZING. I made extensive revisions based on their feedback, just in time for the group’s annual Editor and Agent luncheon held each June, where members practice pitching their WIPs. I pitched Send to Aubrey Poole, an editor from Sourcebooks, Inc. and to my astonishment, she loved it but wanted more revisions, including a different ending. When I could breathe again, I went straight to a much-admired author I ‘met’ on Twitter and asked for help. Bill Cameron didn’t just read the manuscript; he sent me a ten-page email that outlined the problems as well as advice for tackling them. I still have that print out. I keep it with me as a reminder that there is still genuine kindness in this world. I made the revisions to the story and in November, learned Sourcebooks would publish Send AND a second novel currently called TMI. Send will be released August 1st. So, let me sum it up. Without Twitter, I would not have my first book coming out from Sourcebooks Fire this August because I would not have been able to revise the entire story without the plan Bill helped me construct if I hadn’t met Aubrey, because I wouldn’t have been invited to the luncheon if I hadn’t joined LIRW, which wouldn’t have been possible had Jeannie Moon never friended me on Twitter and Kelly Breakey hadn’t convinced me to keep the story instead of deleting it to sell hotdogs on a New York City street corner. Got that? Wait, there’s more. Without Twitter, I wouldn’t have fallen hard for a toothless killer named Avery Cates. I wouldn’t have laughed so hard I wet my pants reading about a professor-turned-zombie. Without Twitter, I wouldn’t have heard about Cartopia in Portland or cried when Conway Sax’s dad tumbled down a chasm. Without Twitter, I wouldn’t have tasted bacon jam! Without Twitter, I wouldn’t have become a real author. Still lost? No problem. I drew a diagram. So, to Franzen and anyone else who says Twitter’s a waste of time, YOU’RE DOING IT WRONG. I am humbled, Patty. And so happy I got the chance to help. This post made me happy. Because it reaffirmed how wonderful you are, Patty — and the awesomeness of Bill. It so great to see people helping people, especially in the case of writing. It’s wonderful. And Twitter is where I happened to meet you, which I am quite grateful for. Bill defines the word ‘awesome’! And thank you, Ali. I am so glad to have found you, too! You are a kind and beautiful person. I’m thrilled The Fabulosity was able to help you! I agree that Bill Cameron is a kind and generous soul but please don’t ever tell him I said so. He’s still in trouble for me for what he did to his character Eager in DAY ONE. I don’t get why people say something is a waste of time. Fine, if they don’t enjoy it, but a bit presumptuous to speak for everybody else in the world I would think. Patty, Like Bill I’m honored to be mentioned and so glad to have been a part of your journey. Just a few short months left and SEND will be available! I hope you’ll read it. Great post Patty! I’m still struggling with making twitter work for me, but this post is inspiring.